White Willow is a shrub with a long history of traditional use. Modern scientific researchers have identified numerous compounds from its bark that contribute to its bioactivity. Of these active compounds, Salicin is best known for its support of the body's healthy response to biological stress. In addition to Salicin, polyphenols and flavonoids have also been found to contribute to its activity. Nature's Way® White Willow Bark has 15% Salicin plus a natural balance of other bioactive compounds that may gently help to temporarily relieve minor pain caused from overexertion and everyday stress. 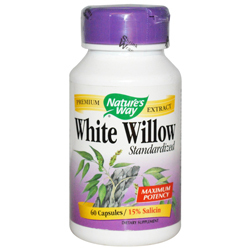 White willow extract (Salix alba) is a natural compound with some structural similarity to acetyl-salicylic acid (aspirin), but with a more gentle release in the body. It is extracted from the inner bark of the tree. Ingredients: (per serving) White Willow Bark Extract (min. 15% Salicin) - 400 mg, White Willow (bark) - 500 mg.
Other Ingredients: Gelatin (capsule), Magnesium Stearate (vegetable source). Not manufactured with yeast, wheat, gluten, soy, milk, egg, fish, shellfish or tree nut ingredients. Suggested Use: Take 2 capsules twice daily, preferably with food. Do not exceed recommended dosage. Warning: For adults only. Not for pregnant or nursing women. Consult physician if taking medications (especially those that may affect bleeding), have a medical condition (including bleeding disorders or ulcers), or are planning to have surgery. Do not take this product in case of allergy to aspirin. Keep out of reach of children.